Grape Seed Extract belongs to a beneficial group of plant flavonoids known as proanthocyanidins (PCO), which are also known as oligomeric proanthocyanidins (OPC's). These flavonoids provide many health-promoting benefits. 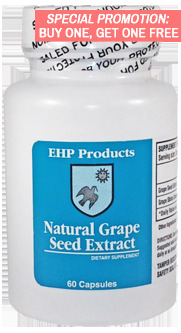 EHP's Grape Seed Extract is actually Activin®, regarded by many as the most dependable source of grape seed extract in the industry. Activin® is a premium quality all-natural extract of Vitis Vinifera grape seeds, providing a rich source of biologically active flavonoids including OPC’s. Our capsules contain 50 mg of grape seed extract as well as 50 mg of ground grape skins. Buy One, Get One Special: Order one bottle of Grape Seed Extract Capsules (60 count) and get another bottle for free. Offer also applies to larger quantities (ex. buy four bottles and get four bottles for free). Offer valid while supplies last.